Our Lehigh Township team headed to States 4/1/17!! 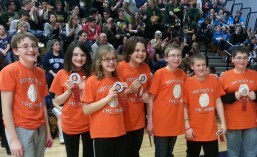 Odyssey of the Mind competitions are held at regional, state and world levels! Teams compete against students presenting the same problem in the same age division. Primary teams (K-2) present their solutions but do not get placed….everyone gets recognized and receives a ribbon. We compete in the Northeast PA Region. The website for our region is www.nepaootm.com. This site is a great resource for the latest news on all NEPA teams, dates, and lots of sample spontaneous problems!